A few years ago, I had mapped out rough drafts of reviews for Ghost in the Shell, Ghost in the Shell 2: Innocence, and Ghost in the Shell: S.A.C. Solid State Society with the intention of possibly even tackling a critique of the first season of Ghost in the Shell: Stand Alone Complex. Unfortunately, I didn’t back any of those files up, so those reviews died along with my Compaq’s hard drive. Someday, I hope to revisit at least one of those films and maybe even write a review, but until that day, perhaps I can at least “atone” for their disappearance with this mini-review of Masaki Yamada’s After the Long Goodbye, a literary prequel of sorts to Ghost in the Shell 2: Innocence. Perhaps in a bid to stave off a nervous breakdown, I’ve been trying to read things from my collection that have nothing to do with my dissertation. After all, it’s about time I catch up on the many, many books that adorn my shelves, but have yet to be cracked open. One such book is the aforementioned After the Long Goodbye, which was purchased at the height of my interest in the popular Ghost in the Shell franchise. 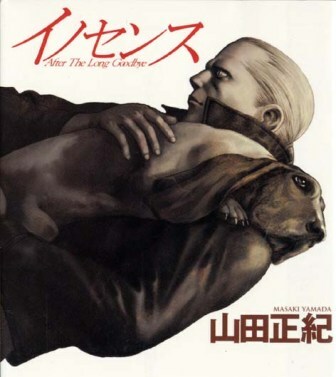 First published in Japan in 2004 and later translated by Yuji Oniki and Carl Gustav Horn for publication by Viz Media in 2005, the novel takes place shortly before the events of GITS 2: Innocence, and is told from the perspective of Batou, the primary male character in the Ghost in the Shell franchise. A soulful cyborg working for the counter-terrorist task force known as Section 9, Batou still carries a torch for Major Motoko Kusanagi, his female superior officer and, as I interpret it, his unrequited love. I would explain what happened to Motoko in the first movie, but I don’t have all day.